This post came about in two ways really, first because of the new Dark Eldar models and second, by way of a Tactical Squad I am working on for a friend of mine. How do Dark Eldar figure into basing you ask? Easy, with the new models and level of detail, I think it's time I look at my basing techniques and adjust them accordingly. The new models (and I'm sure all the new models to follow as well) will have more and finer details. If I just keep applying sand and painting it, it won't be long before my bases start to detract from my models. They are the first unit I am using my new method on. It's a perfect fit since my Client gave me one resin base and asked if I could match the squad to it. Now there's always the resin route and I'll be the first to admit there are some absolutely stunning resin bases out there. But... in the event you don't want to drop the cash on enough resin bases to cover your entire army, you're left with making your own. I started out like most people do I'm sure. With the GW Sand. It works, don't get me wrong, but I'm looking for more now. I quickly moved on to scavenging my own supplies from around my neighborhood. After it would rain, I would wait until the next day when everything was dry and then go collect what had washed down from the parking lots around my house. It had a variety of sizes which is important. This was a step up for me. The only downside is no control over the material and the sizes I picked up. Sometimes the pieces were just too big to even look right in the 40k world. The variety of sizes is important if you're looking for that natural appearance to your basing. Will it be the end of the world if you don't have it? No, but like I said before, I'm shooting for that extra touch now. So what's a hobbyist to do then? We want variety, we want natural appearance and we'd like it to NOT cost and arm and leg. Well it's possible, but comes with a bit of work. 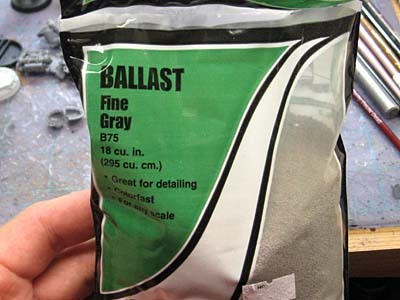 Many, many moons ago, I picked up this bag of Fine Ballast from a local hobby store. It's actually for model railroading. Woodland Scenics makes it and I'm sure you can pick up a bag like this for under five bucks and it should last an eternity. I dug it out of my closest and came up with a plan. I figured I would use a combination of bits, my newly rediscovered fine ballast and some GW sand to get the look I want on my bases. First, I put down any bits I want like skulls, wire, bits of sprue, etc. Those are the big elements. Second comes the smaller things like shell casings, smaller pieces of junk, etc. Third is applying the fine ballast. Using white (PVA) glue, I paint the white glue in place and then dip the base into the ballast. Fourth and final is the addition of the GW sand. Is is considerably larger (in scale) than the fine ballast and so it adds some variety to the base. And, even more importantly, I can control it's application. Just a little bit of white glue again where I want the GW sand to go (right on top of the fine ballast) and I'm all set. I just sprinkle the GW sand on top and shake away any excess. Perfect. But like all things I work on, there's always a hitch. In this case, I now need to pin my model to the base since I created a fairly uneven surface texture and there's no way I'm going to get my model to stand (and stay) on this without some help. For me, it's a fair trade off, at the cost of a little bit more time and having to pin my models to their bases, I can create the world I want, control the scale and application of all the elements on my bases and end up with a much better looking base overall. And then I figured I would paint my "test" base up to see how it would turn out. Not too bad and just right for fine tuning my new Deathwing bases. Another option to pinning would be to use plastic glue and add a plastic riser to the area that you wanted to place the model. The plastic glue is to make sure that you get a permanent bond. Add your details to the base up to the level of the plastic spacer so when the figure is glued it doesnt look like his feet are floating in the air. This would also work for metal models by giving you extra material for the pin to set into without having to fill the bottom of the base. Your bases look very good! Textures and colors are realistic. What about adding some weathering powders? A great tutorial and I agree - the level of detail that miniature manufacturers add to the casting is so much more than what was available just 10 years ago. 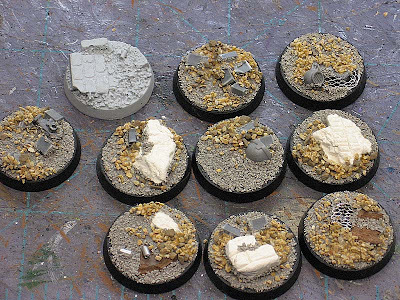 The development of the ready to buy resin bases has meant that there is now no excuse to mounting on just sieved sand. I can see the next BIG gaming development being fully sculpted terrain bases that could be called a model in their own right. The amount of time spent on bases for display miniatures might now become the norm in gaming pieces. However I am not sure I will be re-basing my models - well not for the foreseeable future any way! Danny: I do that if I plan on basing around the mini and I'm not looking to base him with anything crazy. I hate that look where they appear to be sinking into the basing material. morback: I'm not there yet. Maybe in the future I'll venture down that path. I move slow though. Tony: I agree, bases on some minis today are sculpted better than the mini itself. Wow, great looking bases, they really stand out. I'll have to borrow a tip or two for my marines. I think it looks pretty good, but I am not a fan of store bought(GW)sand or ballast as all the pieces are too uniform. Mixing two sizes does fix some of the problem but to me there is still too much uniformity. In this case, the other bits, globs of glue and the nature of an urban rubble style help to keep your eye moving around so it doesn't notice the uniform pieces as quickly. I think you have done a great job with what you have, but proper sand with smaller and more irregular granules would make it better. I would be happy to send you a tub of Super Secret Basing Sand, (the greatest 28mm basing sand in the universe) for you to try out and review. It will make all of your wildest basing dreams come true. SC John: And here I thought it was in the mail already. Now I'll hate to wait until after Christmas to tell everyone what I think about Super Secret Basing Sand. At least my horsey model will be done by this Wednesday. Too bad I won't have the best basing stuff in the world to use on his base. Great take on basing Ron, your tips are greatly appreciated for this rookie. Yet another solid post. Thanks. What do you use for your mesh? Maverick822: Don't sell yourself short, I'm still learning how to do this too. GDMNW: It's the same stuff I picked up and used on my science fiction model in the back to basics series. It's some kind of plastic screen for knitting or something that I got from Michael's craft store. 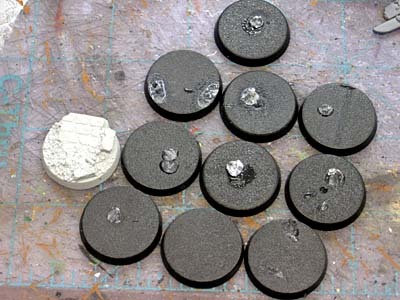 With the addition of a 70 dollar kit from www.Alumitecom you can cast these bases and make an unlimited supply of them. I cast all of my bases now. It only takes a 1 minute for the resin to cure, and I can easily rebase entire armies in a day. 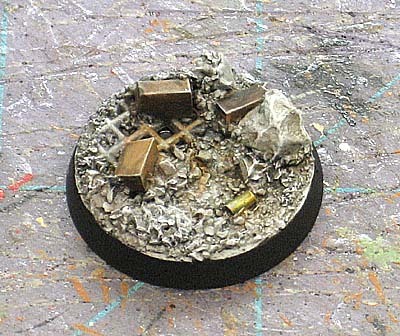 Whenever I see a basing post I always self-promote my own post: http://fester40k.blogspot.com/2010/10/how-do-i-do-my-basing.html and suggest people look outside gravel and rocks and at other options, like tiling / slate / etc. Also another option instead of sand.......GROUND COFFEE!!! You can buy a large can of coffee cheap and really almost never use it all. The size of the grinds always vary in size. I have used coffee several times and never had a problem with it. Just seal everything up once the glue dries! I've found that I can get perfect sand by going to Home Depot and picking up a 20 pound bag of play sand (used for sand boxes) for like 10 dollars. Actually, I bought a bag for my kids' sand box and stole a container's worth from them. It looks just like GW's sand and costs virtually nothing. I Mixed it with the ballast you have listed (had it for 20 plus years! lol) for a 1:1 ratio. Another hint: after the glue dries, I have an 89 cent spray bottle that I mix white glue, lots of water and a dot of dish soap. I mist the bases until they are soaking, set them in front of a fan for an hour, and voila! double glued good looking bases. Ok, stupid question. Is that PVA glue on the base in the first stage of creation before you started adding bitz? I'm just asking as you don't mention putting glue down until step 3 and I'm just wanting to make sure :). Drathmere: I've thought about doing that, but I've only got 10 guys in my army. fester: Good point about having a base that is different in value to your model to make it stand out (light model/dark base... dark base/light model). Danny: I've never heard of people using that. If it works though... why not? Anon: Sounds similar to mine here, but you mix your two sizes together with the added bonus of it being very cheap and cost effective. Nocturus: Good question. I should have mentioned it earlier. The larger things can be glued down with PVA (white glue), but in this case, I used super glue for speed. I suppose it doesn't matter what you use as everyone has their preference. What did you use for the shell casings? Dj batman: It's 1/16 aluminum rod I picked up online. I got them from K&S Engineering. They are stock number 1008 if memory serves me correct. Just cut them in short pieces to fit what you want to do.